The White Rose Guest AccommodationThe White Rose was built in the Victorian era and has many original fixtures. We are very close to many shops, cafes and restaurants. There are also many great long or short walks in the vicinity such as Orrest Head and School Knott. All guests have unlimited access to the house. We accept children over the age of 14 years. The White Rose sometimes limits bookings to 2 or more days. Bedroom 1 is a quiet, first floor double bedroom. This bedroom can be used for single occupancy at certain times of the year but please note that a supplement will be payable, with ensuite facilities including a shower, hand basin and toilet with toiletries and towels provided. The bedroom has a fitted wardrobe, side cupboards, a digital TV, an alarm clock, extensive hospitality tray, and a hairdryer. This bedroom is situated away from the road and is a quiet, peaceful bedroom. Bedroom 1 sometimes limits bookings to 2 or more days. Bedroom 2 is compact but a very pretty ensuite double bedroom on the first floor of the house. The bedroom overlooks our rear courtyard. This bedroom can also be used for single occupation through the year (excluding Bank Holidays). There will be a supplement when used as a single room. The bedroom is well furnished with a fitted wardrobe, bedside tables, TV, hair dryer and extensive hospitality tray. This bedroom has ensuite facilities of a toilet, hand basin and shower with toiletries included. The bedroom has a double bed, a digital TV and DVD player, an alarm clock radio, a hair dryer and tea making facilities. The bedroom is situated away from the road. Bedroom 2 sometimes limits bookings to 2 or more days. The bedroom has a double bed. The bedroom is comfortably furnished, with fitted wardrobe, a cupboard and bedside tables. The bedroom has a large digital TV, a hair dryer, alarm clock and an extensive hospitality tray. There is also the use of a mini fridge. This room also benefits from a comfy sofa for some chill out time. Bedroom 3 sometimes limits bookings to 2 or more days. On the second floor of the house, bedroom 4 has a comfy zip and link bed [Please let us know on booking] and is a twin bedroom. The room is well furnished with a fitted wardrobe and a fitted cupboard. The bedroom has a digital TV and, an alarm clock, a hairdryer and an extensive hospitality tray. This bedroom also has ensuite facilities including a shower, a toilet and hand basin with toiletries included. As mentioned, this bedroom is on the second floor of the house. When reserving this bedroom please tell us whether you would like it for twin or double occupancy. The bedroom is usually configured as a twin room. Bedroom 4 sometimes limits bookings to 2 or more days. Leave M6 at jct 36. Take A590 towards South Lakes for 3 - 4 miles. 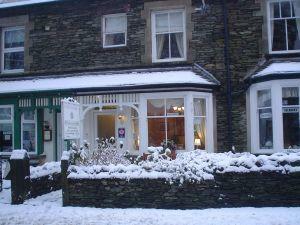 Then take the A591 towards Windermere for 10 miles. Turn left into Windermere village, Nat West Bank on right, TIC on left. Travel through one-way system. Immediately after pedestrian crossing, turn left into Broad Street. The White Rose is at the far end on the left. Graham and Alison, lovely couple hosted us. The service was extraordinary. We enjoyed our stay. The place is maintained neatly. Graham, gave us tour ideas on how we spend our day at Windermere. We went on walking tour around the lake, Breathtaking! He gave us landmarks and tips on restaurants. Very useful information. The breakfast was sumptuous. I loved it. My husband enjoyed the pork sausage. I opted for vegen breakfast and it was delicious. Overall, we had a great time. Thank you. Hi Ashritha. So good to hear you enjoyed your stay with us.And you are welcome,It was great to meet you. Graham and Alison. We do not have the facilities for wheel chairs unfortunatly. Mild disabilities can be catered for in regards to mobility ie we have rooms on the first floor with one set of stairs [not steep ] please feel free to get in touch to discuss this.